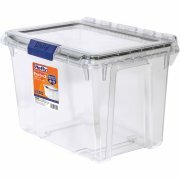 Hefty storage introduces their most secure storage bins to date with the new Hefty Protect series! A unique collection of gasket sealed totes clear box with a see thru, attached hinged lid. Perfect for outdoor storage, garage storage, shed storage and outdoor activities such as camping, hunting or boating!